Government scientists trying out a new kitchen safety training video got an unpleasant surprise when they watched how people behave during food preparation. Not only did their volunteers fail to use meat thermometers properly — or even at all in many cases — but they failed to wash their hands and spread germs all over the kitchen. They videotaped their volunteers and counted thousands of instances in which people spread germs from raw meat to salad, refrigerator handles and even spice containers. The findings help explain why 48 million Americans catch foodborne illnesses every year, said Carmen Rottenberg, top food safety official at the U.S. Department of Agriculture. “There were many, many times in the course of the study that people had the opportunity to wash their hands — nearly 1,200 opportunities,” Rottenberg told NBC News. Yet people failed almost all of the time, close to 98 percent of the time, the team found. The USDA team was trying out a new video to help people understand how and when to use food thermometers. They showed the video to 182 volunteers, and didn’t show it to another 201, and then put all of them into a test kitchen and asked them to prepare turkey burgers and salad. The volunteers were videotaped as they worked. Those who had watched the video were twice as likely to use a meat thermometer when cooking the turkey burgers, the USDA team found: 75 percent of those who’d seen the training video at least tried to use one, even if they did it incorrectly. That compares to just 34 percent of the volunteers who did not see the video. “They had access to everything in the kitchen but perhaps they didn’t think about the meat thermometers,” Rottenberg said. 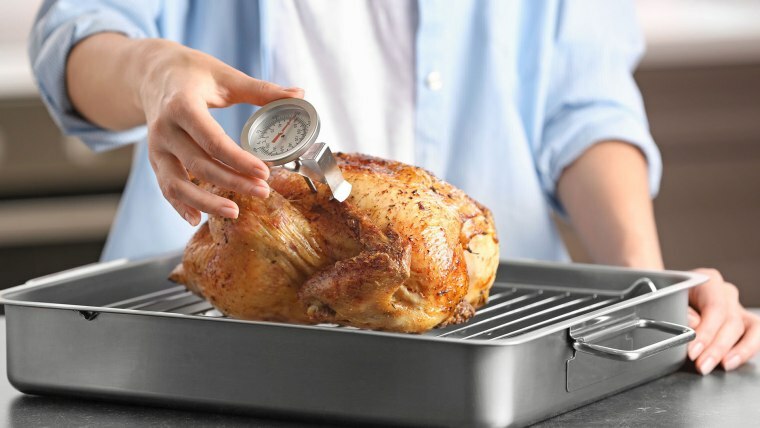 They should have — the USDA and CDC recommend always using a meat thermometer to cook raw meat. “We know you cannot tell if the burger is done by cutting it or looking at it,” Rottenberg said. But worse, most of the volunteers handled the raw turkey meat and then touched something else in the kitchen, including salad greens, without washing their hands or after insufficiently washing up. “The basic safety practice you can employ in your kitchen, which is washing your hands, is not something our participants did,” Rottenberg said. The USDA team had spiked the turkey meat with a harmless virus that is often used to substitute for norovirus in lab tests. They tested kitchen surfaces and the salad and found it everywhere. “In some cases the participants did not wash their hands at all, and in other cases they washed their hands and were ineffective,” Rottenberg said. Five percent of the salad lettuce ended up contaminated, the team found. “If this had been at someone’s home, they would have sat down at the dinner table and enjoyed that salad and it would have been contaminated with bacteria,” Rottenberg said. Even salt, pepper and other spices were contaminated with microorganisms from the raw turkey. “They grabbed those spice containers and then put the spices on the burgers and then put the spice container back down,” Rottenberg said. Food safety is especially important during outdoor cooking season, when people often don’t have access to food and water and might not check meat on the grill for proper cooking temperatures. Alcohol- or bleach-based hand wipes are a good substitute, Rottenberg said, and should be used frequently. It’s also important to get food refrigerated within an hour in hot weather, the USDA said. The USDA extrapolated how many people would get sick if every household prepared turkey burgers and salad using their current bad habits. Nearly 6 million households would transfer bacteria from raw poultry to salads; nearly 57 million could have bacteria contaminating spice or salt shakers and 12 million would have bacteria on fridge door handles. Anything raw can be contaminated with bacteria, but meat and eggs are especially likely to carry germs that can be transferred to people’s hands, surfaces, or other foods. Poultry (whole and ground): 165°F.